Delete the highlighted features. Visibility of this tool is configurable in the Event Editor config file. Export the selected features as a file in the CSV file format. Filter the attribute table view. Select a point feature on the map to move the location. This tool only works with point feature classes, such as address points. Show related records for the selected events. If you have multiple layers that represent the related data, you can choose the one to use to view the related data. This tool is enabled only if relationship information is available through the map service. 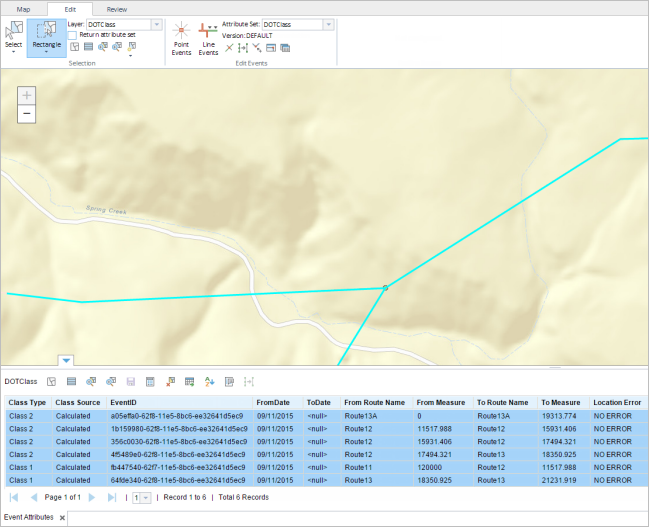 To publish a relationship in the map service, you must have both the Origin table or event feature class and the Destination table in your map. Simple relationship classes with one-to-one (1:1) or one-to-many (1:M) relationships are supported. Double-click a cell in the table to allow the value to be edited. If it is a point feature class, such as address point, you can use the Select Point to Move tool to select and move the point feature. Edited cells in the table appear in yellow until saved. Coded value and range domains are supported when configured for any field in the Event Attributes table. To make the changes to the cells in the table permanent, click Save to save the edits. A Save Options dialog box may appear depending on your configuration. Optionally choose a save option. Determining whether any of these options is applicable should be based on the reasons for editing the events. Merge coincident events with the same attributes that are edited only works with nonreferent events. If the edits are for error correction or a similar workflow, and the event record does not need to be retired and time sliced because the changes are correcting a mistake, do not check the Retire edited events and create new events effective check box. If the edits represent changes to the events at a certain time (such as a speed limit changing from 50 to 55 on 09/22/2014), check the Retire edited events and create new events effective check box and click the date drop-down arrow to choose the retirement date, or type the date in the date combo box. The old event will be retired and the new event will begin on the specified date. If multiple edited events are coincident in measure and attributes and you want to combine them into a single event record, check the Merge coincident events with the same attributes that are edited check box. If you want to keep events that are coincident in measure and attributes as different event records, do not check the Merge coincident events with the same attributes that are edited check box. If a cell is gray, it's unavailable and can't be edited. If a cell is white, it can be edited. If a cell is yellow, it has been edited in this edit session but the edits have not been saved. If you want to enter the same value for a field in several events, follow the steps below. Click the Calculate Field button on the toolbar of the Event Attributes table. The Field Calculator dialog box appears. Click the Update Field drop-down arrow and choose the field to be updated. Type a value for the field in the Field Value text box. If the field has a coded value domain, choose a value from the Field Value drop-down menu. If the field is a date field, choose a date from the calendar. The records in the Event Attribute table are updated. If the edits are for error correction or a similar workflow and the event record does not need to be retired and time sliced because the changes are correcting a mistake, do not check the Retire edited events and create new events effective check box. All the rows in the field get the updated value from step 3. If you find an unavailable record, that is, none of its cells are editable, check to see if the event ID for that record is missing or null. Ensure the event ID field's data type is a string with a minimum length of 32 characters. In such cases, when adding a new event and not providing a specified event ID, Event Editor automatically assigns a GUID to the event. If the event ID data type is not a string with a minimum of 32 characters, Event Editor will not automatically assign a GUID for the event. In such cases, define attribute sets to designate the event ID as an attribute for input. For more information about configuring and defining attribute sets, see Producing attribute sets and Configuring attribute sets. If relationship information is available through the map service, you will see the Related Tables button. 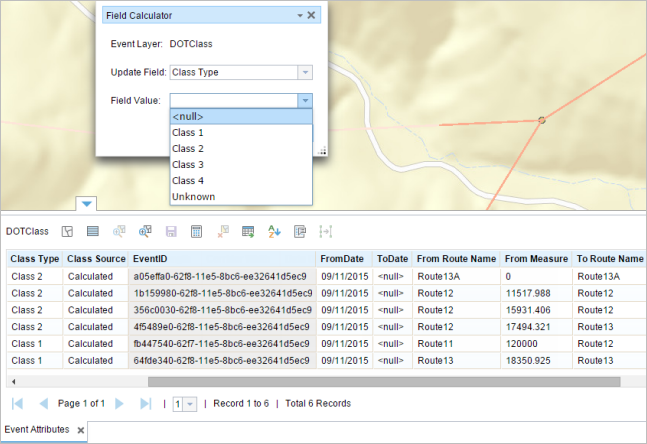 To publish a relationship in the map service, the Origin table or the event feature class and the Destination table must be in your map document. Simple relationship classes with one-to-one (1:1) or one-to-many (1:M) relationships are supported. The records in the Related Records table are for viewing purposes only and can't be edited. Click the Related Tables button . Click the name of the related record you want to access for the selected events. If you have multiple layers that represent the related data, you can choose the one to use to view the related data. You already have an event lock on the event layer in which you are currently working. You already have a lock on the route on which the event is located in the same database version. You already have a route lock on the concurrent route of another network, in the same version in which you're currently working. You can edit an event layer if other events along the same route have locks acquired by different persons in different versions.